The present Côr Meibion Colwyn was formed in November 1972 when a group of sixteen former members of the Old Colwyn Aelwyd (i.e. youth) Choir joined together with Gwilym Davies as their conductor. Once established the choir took part in local concerts raising funds not only for themselves but also for local and national charities. With increasing popularity, and a rapidly expanding repertoire, the choir decided to raise funds for the provision of uniforms and started entering in choral competitions. The choir was noted for its good balance of voices, and steadily gained reputation as one of the leading choirs in North Wales. Sadly in November 1975 Gwilym Davies passed away and the choir baton was taken up by Neville Owen, at that time a music master at Prestatyn High School. Under his leadership the choir grew in stature and gained many notable awards at competitions. 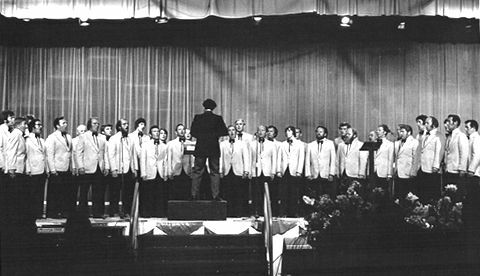 In 1976 the choir won the Class ‘C’, under 40 voices, competition in the Royal National Eisteddfod of Wales in Cardigan. The National Eisteddfod is held annually and is the major music and arts festival in Wales with audiences of over 100,000. In 1979 the choir membership grew to over 100 and the choir won the premier Class ‘A’ (more than 60 voices) in the National Eisteddfod at Caernarfon. 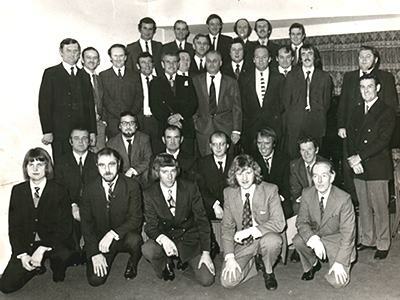 Travelling overseas for the first time in 1979 to Ireland it returned home having won first prize in the Male Voice competition in the Cork International Music Festival. Concluding a successful year it also took first prizes in the Vale of Conwy Eisteddfod and the local Colwyn Eisteddfod. 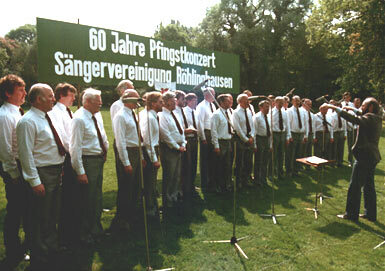 In March 1980 it had the honour of taking part as the special invitation choir at the St David’s Day Festival in the Royal Albert Hall in London. 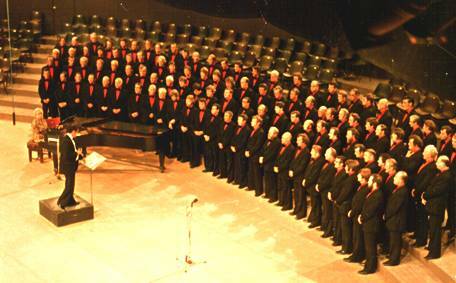 After the 1980 concert the choir has sung at the Royal Albert Hall a number of times with other choirs in the Thousand Male Voice concerts. However, nothing can compare with the invitation to sing as the single guest choir in 1980.